Increasingly, access to information quickly and effectively is a decisive factor for a more demanding public in the technological age we are in. PARTTEAM & OEMKIOSKS which has always been providing and working for this technological evolution, was responsible for the production and assembly of interactive digital billboards, for the town of Vila de Arcos de Valdevez. The project was conducted and implemented by the company BLU, a business technology partner of PARTTEAM & OEMKIOSKS. These solutions are indispensable for the progress and technological evolution, in smart cities the focus is on the formation of the intelligent citizen who is the one who becomes the producer of information and content. In the village of Arcos de Valdevez, a PLASMV digital billboard with a 46” touchscreen display was installed, in which it is possible to navigate in informative thematic areas, through interactive maps, with information presented in a segmented and georeferenced way. 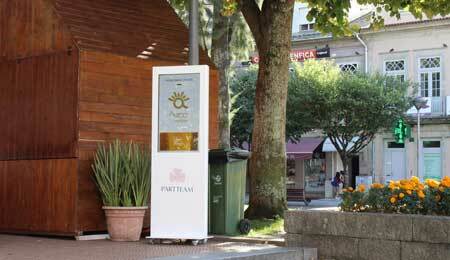 Digital Billboards are equipped with free WI-FI and YPORTAL Software, PARTTEAM & OEMKIOSKS, which allows Arcos de Valdevez citizens to experience a digital experience, providing immediate satisfaction and ease in researching information about the city. The YPORTAL Software integrated in the digital kiosks and digital billboards of PARTTEAM & OEMKIOSKS, supports the digital transformation of Smart Cities and relates citizens with cities, parishes, services, etc. PARTTEAM & OEMKIOSKS develops customized solutions for any sector, offering an alternative to the traditional ways of transmitting information. Recommended reading: DOOH: The main advantages of this type of communication Know more, click here.